Fiji ‘Flooding’ is Fake News from #COP23 | Watts Up With That? Whatever economy, politics and project agendas may want to put in the center, the true scientific community must insist that only facts as revealed in nature itself and in laboratory experiments can provide trustworthy results. Figure 1. 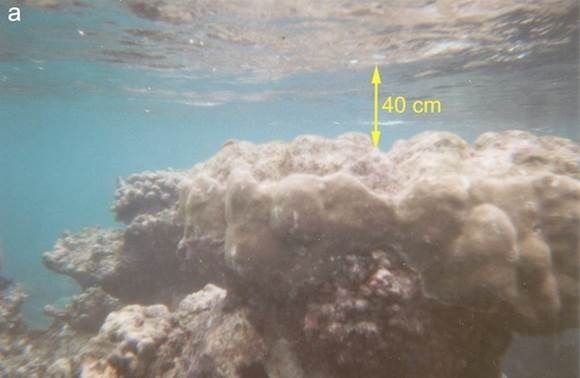 The critical depth for coral growth is 40 cm below low-tide-level (when the photo was taken). If sea level is not rising the corals are forced to grew laterally. We have studied several such cases at several different sites in the Fiji. We undertake radiocarbon dating at al number of sites of the dead center always with ages as ”younger than 1950”, implying that sea level has remained perfectly stable over the last 50-70 years – and corals do not lie. Figure 2. Sea level changes in the Yasawa Island of Fiji (from Mörner & Matlack-Klein, 2917c). Sea level was high in the 16th and 17th century (1), low in the 18th century (2) and at about the present level over the 19th, 20th and early 21st centuries (3) wit a somewhat higher level in the early 19th century and with a perfectly stable sea level during the last 50-70 years as indicated by C14-dated microatolls at multiple sites. Consequently there is a total absence of a present sea level rise – i.e. the threat of a future flooding is lifted off. Acknowledgements: Our research group has had the pleasure to undertake sophisticated studies in the Fiji Islands. We have become much in love with the remarkable nature and the wonderful local people of the Yasawa Islands. Our criticism should be seen as a sign of our respect to the irrefragable field evidence, and the nice local people that certainly deserve straight-forward and unbiased information with respect to their own future environments. Mörner N-A (2017) Coastal morphology and sea level changes in Goa, India, during the last 500 years. Journal of Coastal Research, 33: 421-434. November 13, 2017 in COP conferences, Opinion, Sea level. Sorry, this won’t get an, errrr, ‘rise’ out of alarmists. The alarmists know they Fiji politicians in their pockets. It would be criminally negligent for the political leadership of Fiji to not sign-on to the agreements in order to get no-strings attached, free climate aid money. That free money can be used for building infrastructure resilience into the power grid and fresh-water construction projects. The way to stop the bribery is to insist these Island governments sign-up for a similar future de-carbonization of their energy needs just as the developed nations are required to commit to. Wouldn’t work. They’d just say “sure!” and then not. Who’s going to be chasing the Fijians for their emission targets? Get real. When their CO2 emissions targets get tied to their fossil fuel imports. As they have no fossil fuel reserves of their own. Fiji is a group of volcanic islands whose real threats to inhabitants include: volcanic eruptions, cyclones (aka hurricanes or typhoons) and tsunamis. Anything related to climate change is much too slow to warrant consideration. Oh Bob, I do hope that’s not right. One of my girls is out there looking out for the turtles – by accounts nobody else is, apart from the low-life’s who wanna eat them or turn ’em into hotels. How dare your daughter interfere with the customs of the indigenous people. Naaah……..the only threat to Fiji is whether they win the next Rugby sevens world title, their national game. And when the fifteens team leaves the island to play overseas, the land mass rises by an inch. New Zealand and Fiji have each won the World Cup sevens twice. Very big blokes and some very small; the game is tough and fast! No such thing as a small Rugby player nowadays. The late Joost van der Westhuizen, a scrum half, and in my opinion one of the greatest Rugby players ever to grace the game, was 6′ 2″, Mike Phillips, the former Welsh scrum half is 6′ 3″. The late Jonah Lomu, a winger, 6’5″. Leigh Halfpenny, the Welsh full back is 5′ 10″ and looks tiny compared the the other 29 players on the pitch. I could go on. I thought it was cricket. Agentlemen’s game that no outsider can understand. Fijians don’t have the patience for cricket; you need to be English or Asperger’s for that. Played a bit of Rugby against Fijians at school and being white I found lifting large blocks of steel was necessary to prepare for encounters with guys born with the ability to run 100m in 10.5 seconds weighing 105kg. That sounds a bit mean. Are you saying much of India and Pakistan suffer from Aspergers? The most civilised of games played over 5 days with plenty of opportunity for good lunches and high tea. What is there not to like about that ? You’re telling me you understand Rugby? Having played it in my youth, and watched the game ever since, I still don’t understand some of it. And cricket is one of the least socially discriminatory games on the planet, a billion or so Indians and Pakistani’s will testify to that. It’s also the most popular game on the planet thanks to them. Sorry forgot about India and Pakistan; apparently they now run the game. Don’t forget the Aussies, but with the possible exception of Bangladesh, the rest, including England, are now minor participants in the game compared to the Indian sub continent. Not wholly unsuccessful, but in terms of participants and support, bit part players. Oh, I understand rugby. One team gets points for putting the football over the goal. Plenty of Blackeyes, full-body checks, running full speed with a ball getting clocked to go around. Scrums, hookers, props, wingers. All makes sense. No, both teams get points for scoring a try, conversion or penalty, “putting the football over the line” more usually means the ball is handed back to the defenders for a scrum or drop out. To score a try, must the ball be on, or over the line? And when can a try be scored without touching, or going over the line? Body checks are deemed illegal and result in a penalty, the arms must be engaged in a positive effort to ‘tackle’ an opposing player. What’s the difference between a scrum, a ruck and a maul? and when does a maul become a ruck? And why would a team be forced to hand the ball back to the opposition after winning it and a maul being formed. Which direction must a pass be thrown? And what are the rules around an intercepted pass? What’s offside, what’s accidental offside and what are the sanctions? No peeking at Wikipedia now? Cricket is simple by comparison; Protect your wicket with a bat, from a ball ‘bowled’, not thrown, from the opposing crease. The bat is the only defence to a bowled ball, hence LBW (Leg Before Wicket) in other words, the defenders leg or other body part is between the wicket and the ball, when the ball is delivered. 1 run awarded for each time the the batting team run between the creases after playing the ball, or not. 4 runs awarded if the ball reaches the boundary of the pitch but bouncing first, and 6 runs awarded for a ball hit directly over the boundary. Cricket is claimed to be the only team sport where the audience and the players can have high tea without interrupting the game. Fast because those rugby players do not wear all that protective equipment like American football players. But everyone knows the most civilized game is croquet. And that was after ten or eleven days’ play. A touchdown must be touched down. What a concept. The extra point must be kicked from the angle where the touchdown was scored. Both those should be brought back to the NFL… at least the extra point rule. Rugby doesn’t have a ‘touchdown’ it’s called a ‘try’. And it’s two extra points for a ‘conversion’ following a try. The conversion can be taken from any point on the pitch in line with where the try was scored. But I get what you meant. And the matches are 80 minutes long so wholesale changes of team aren’t necessary. Two matches in a row can be watched comfortably. But, but, but … what about all the bleached coral!? I thought coral was the canary in the coal mine WARNING humanity that we are KILLING the planet!? Sadly nobody cares about actual science. If these studies don’t result in a transfer of cash from richer countries, nobody will read them. Shhhh! We just about had the EU all ready to give us an ton of money and if you don’t keep quiet you’re going to blow it for us. We don’t want to have to earn a living waiting on tourists when there’s sweet, sweet International aid money to be had, just for nodding and wailing, “Yup, the water’s getting closer to my grandmother’s house! Facts don’t really matter in diplomacy. It’s a form of lobbying with more travel and parties. It is ‘Congress fo’ Parties. Alas, that is exactly what is currently going on in Bonn. I just returned from Dusseldorf and the EIKE conference, our Counter-Cop23, where we presented our Fiji findings. It was two days of excellent presentations and genuine science. If honesty and ethical behavior could change the prevailing attitude of the “97% Consensus” all those rent-seekers and free-loaders in Bonn would be slinking home right now with tails tucked tightly between their legs! If Fiji thinks they need a few more islands they might ask the Chinese for help. How odd that the Chinese don’t seem to have any problems with the minutely rising sea level. FINALLY, someone studying sea level that actually knows about the science of sea level. Many thanks to you for recognizing our supreme effort put forward for the benefit of the Fijian people. Their islands are beautiful and safe from flooding. If the IPCC does give them tons of money, one can only hope that it goes to the lovely Fijians who live on the outer islands. They rely on diesel-powered generators for electricity for refrigeration, an expensive option. This is not the case on Vita Levu. from personal experience the British Admiralty charts of Fiji show no detectable change in sea levels in the 250 years since they were surveyed. a drying rock from 250 years ago at mean low low water is still a drying rock today. a rock awash is still a rock awash. If someone offered me a huge pile of free money to declare my commitment to fighting climate change, I’d do it too. That is all this is for the Pacific Island countries and the rest of the developing world countries. Simply, bribery to join the climate hustle, which then serves as a propaganda tools back in North America and Europe. There is a much simpler way to see if any Pacific Island is really in imminent peril from the sea — land prices. If these island are really in imminent danger of inundation then the land price would fall. None that I can find have fallen in price. I have wanted to buy one of these islands for some time but nobody wish to sell at knockdown prices for allegedly doomed piece of real estate. Funny how these populations have grown on ‘doomed’ Pacific islands. Meanwhile, it appears they are attempting some sort of end-run around Trump, around the US Constitution, and around democracy itself, with a Bonn-Fiji Commitment on Climate Action . I believe their actions border on treason. The only thing that Fiji wants from this charade is the free money (no strings attached & no commitments to de-carbonization). The Paris Agreement specifically makes no de-carbonization demands on the 3rd World/Developing nations. That “no-commitment commitment” is the only way to bribe them to climb on-board the climate hustle train. If Europe wants to throw away hard Euros to the hustle… their choice. Meathead Schwarzenegger is a private citizen free to express his opinion. Gov Moonbeam can talk all he wants too. He just can’t sign onto anything that commits State California revenue to the Paris Agreement. US Constitution. Article I. Section 10. That’s pretty clear language. If Governor Moonbeam tries to sign anything that commits California to anything at all in Bonn, someone in California will file a federal court lawsuit and get a Permanent Injunction against it. I doubt even the 9th Circuit Court, as Liberal Stupid as it is, would be able to overturn such an injunction against such clear language in the Constitution. And If’n they did, the Supreme Court would make them look the dishonest fool once again. The Ninth Circus actually following the Constitution? Well that’s the point isn’t it. Any and all are perfectly free to put their own money into such schemes – just not direct the federal budget. So as time goes by we should be keeping a spreadsheet of the leftists squawking demands vs their actual contributions. I’m a cyclist and donate to an organisation dedicated to the generation and upkeep of cycle paths. It’s easy to tell I support it because I give them money. Is it possible to have some sight of the support of leftists for the Fijian imminent submersion beneath the Pacific waves? No wait! I forgot. They’re socialists so it’s OPM. No rise despite ‘massive’ CO2 increase . . .
24-year data log from Lautoka SEAFRAME tide gauge run by Australia’s Bureau of Met. (Vertical crustal movement is measured by Global Navigation Satellite Systems and high precision terrestrial levelling to the relative measurements of the tide gauge). No rise from any perspective; over and out! So why on earth would any credible researcher choose to publish in such a journal? And why would anyone pay any attention to any article published in Natural Science? I am not sure whether your comment is made simply as an ad hom since you make no comment upon the underlying data, or otherwise set out any legitimate factual criticism of the findings behind this article. Mörner is one of the most preeminent experts on sea level, and was involved in some of the IPCC Reports. my question is more general – how do you decide which journal articles are worth reading and/or paying attention to? There are more papers being published every year of which a sizeable number are not worth the e-paper they are printed on. If you are a novice in the field would you choose to believe an article published next to one about free-energy and other compete nonsense or would you choose to believe an article published in a suitable journal surrounded by other similar articles? And if Morner is a “preeminent expert” then surely he would be publishing in the top journals. Sort of like “Richard Lindzen would surely be publishing in top journals if he was a pre-eminent expert”? After having to publish their landmark paper in a lesser journal the climateers then had the hide to question the paper because of the journal it was published in. Maybe just read the paper and check the data like scientists should, eh? papers published each year than any scientist could hope to read and there has to be some sort of quality control in deciding which articles are worth spending time on. And there is nothing that would convince any scientist that a paper published in Natural Science is even worth glancing at. Real science that goes against the AGW meme, is heavily blocked from a lot of journals. Much to the detriment of science. It means all those journals enforcing AGW end up being full of mindless, brain-washed anti-science mantra. That’s the stuff you read , Germ. ! As I have personal experience with the difficulty of getting “real” research published in the major journals, I can comment on this. Germ, do you actually believe that what is appearing in Science, Nature, JCR, Science News, Geology, and other “respected” journals is good science? The peer review system is broken beyond repair when cronies get together and praise each others garbage. However did the infamous hockey stick get credence? What about the imminent death of the GBR? The Maldives being flooded? Where are all the climate refugees we keep hearing about? There is more fake news coming out of Bonn right now and it is sickening to anyone with the ability to simply walk outside and take a look around! 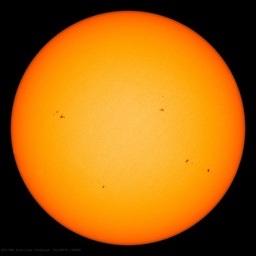 The World is NOT catching fire from climate change, more likely we are in for some much colder winters and summers as we slip down into another Grand Solar Minimum. Invest in warm clothes! PMK – you already know who I am! This calls for a repeat of a comment that I posted a year or so ago. In November 2013 my wife and I were on vacation at the Turtle Island resort in the Yasawa Islands. There were three airborne photographs of the approximately 1000 acre island on the wall in the lounge. One picture was from about 1966 when the owner, a prominent businessman from San Francisco, purchased the island. The other two pictures were taken around 1986 and 2006. In all three pictures, the coastline looked nearly identical, there was no visual evidence whatsoever of a change in sea level. As Niel-Axel Mörner points out in his letter, the people of Fiji are very friendly. We still keep in touch with members of the resort staff via Facebook. They love to tell stories, and talk about the many famous people who have visited the resort over the years. One of these “celebrity” visitors was none other than Al Gore! I’m guessing Al must have seen these pictures, but has chosen to ignore the inconvenient evidence. In those 40 years between 1966 and 2006, global sea level rose about 3 inches. Mostly due to isostatic expansion. 3 inches is not enough to notice in a photo. The climate hustlers use model scare stories combined with hypothetical Antarctic melt to 3 feet or more of sea level rise in the next 80 years. The sea rise alarmism must stop from fake scientists. It is a scare story no different than a fake Hollywood horror film. That graph of the sea levels the author made for Fiji doesn’t make any sense to me. Sea levels around the world have been rising for centuries at a slow rate… so why the big drop and the change of direction twice? There are sea level changes associated with the ENSO, both positive and negative. I don’t know if that is what is going on here, but a decided possiblity. Rotational Eustasy, not Glacial Eustasy, affects SLs around the equatorial regions. This is controlled by the sun…. Read the entire paper, it is made very clear. The South Pacific Sea Level and Climate Monitoring Project was developed as an Australian response to concerns raised by members of the South Pacific Forum countries over the potential impacts of the Greenhouse Effect on climate and sea levels in the region. In 1991 the National Tidal Facility (ex Flinders University, SA) was awarded the contract to undertake the management of the project. Eleven monitoring stations were established (Cook Islands, Fiji, Kiribati, Marshall Islands, Nauru, Papua New Guinea, Solomon Islands, Tonga, Tuvalu, Vanuatu, and Western Samoa) to provide comprehensive coverage of the Pacific Basin. Each ‘Sea Level Fine Resolution Acoustic Measuring Equipment’ (SEAFRAME) station continuously monitors sea level, air and water temperature etc. In addition to the SEAFRAME tide gauge the Australian Monitoring Network includes a network of earth monitoring stations for geodetic observations (implemented and maintained by Geoscience Australia). The earth monitoring installations provide Global Navigation Satellite System (GNSS) measurements to allow absolute determination of the vertical height of the SEAFRAME tide gauges. The data is intended to help Island countries and their Governments understand the scale and implications of changing sea levels and climate. The data is provided at no cost to the Islands but at massive expense to Australian taxpayers. The Fijian Government thanks us by blatantly lying for political and financial gain. Fiji should be held accountable by Australia at the very least! Unfortunately the current Australian ‘conservative’ Government fully embraces the AGW scam so no action will be taken. Another costly AGW rip-off where ‘scientists’ are well paid by us for zero benefit. odd at a beach with rocks i know since childhood in Spain i didn’t notice any change as well…. there is one rock that’s only surfacing at low tide on a tidal range of 6-7 inches. you can guess: when i returned that rock that only has a height of about 5 cm (2 inches) above low tide…. still was there and appearing at low tide maybe a very slightly bit less but if that’s the real sea level rise in 30+ years i am scared to death!!!!!! then the so feared 1 meter rise of the sea levels would be achieved in 30*50 = 1500 years…. very scary to be honest…. Mmm … I’ve spent a lot of time underwater on both Fiji and a number of other nearby tropical Pacific islands. I fear that I do not accept the underlying idea, that we can accurately determine the sea level (either now or historically) by examining the height of the corals. Figure 1. The critical depth for coral growth is 40 cm [16 in] below low-tide-level (when the photo was taken). If sea level is not rising the corals are forced to grew laterally. He also claims zero sea level rise over the last century in Fiji. I disagree for several reasons. Let’s assume that by the “low-tide-level” he means what is called “Mean Lower Low Water” (MLLW). This is the average depth of the lower of the two daily tides. It is also the depth that is referenced on standard marine charts. Now, that is an imaginary depth. The ocean knows nothing of that. An El Nino comes around, and sea levels all over the western Pacific drop radically … go figure. And when that happens, the tops of some (but not all) of the corals may die back. There is an additional difficulty, which is that the locations where the corals are growing are NOT the location of the tide gauge … and every different location has different timing and height of the tides. So when you are squinting at some coral, how can you tell where the MLLW for that exact spot in the ocean might be located vertically. In short, I find the idea that we can use the height of corals to reliably determine the sea level with the necessary accuracy to be … well … dubious. Next, the western Pacific actually has some of the best recent sea level data in the world, because of the Australian SEAFRAME program. This program, begun in the 1990s, has placed co-located tidal gauges and GPS units across the western Pacific islands. ALL of them show some level of sea level rise … so I find the claim that zero rise in the Pacific is solely and uniquely occurring if Fiji to be … well … dubious. Finally, long-term tide gauges around the planet in areas of geological stability, along with modern GPS-adjusted tide gauges, agree that the sea level has been rising worldwide over the last century, with a global average rise in a hundred years on the order of twenty cm (eight in). In conclusion, I fear I do not find Professor Morner’s arguments convincing. Indeed, many studies have shown healthy corals can easily keep up with 2-3 cm/decade sea level rise. Sea level rise will not hurt reefs. It will hurt improperly placed human coastal habitations. It is sea level retreat, like what happens with an El Nino SO high pressure, which causes months of low sea levels or worse, and the descent to glaciations that cause sea level drop, that cause much bleaching and distress on coral reefs. Willis check the SEAFRAME data again. There is no trend for Fiji (based on Lautoka) since data commenced. Lautoka is the only accurate data available for Fiji. Suva shows a slight trend but it’s not a Baseline station. Can you shoe me how you see any trend in the Lautoka data? As at June 2002, based on the short-term sea level rise analyses performed by the National Tidal Facility Australia of over nine years of Lautoka data, a rate of +7.5 mm per year has been observed (as compared to the global average, published by the IPCC, of around 1 or 2 mm per year). The Short Term Sea Level Trends plot shows how the trend estimate has varied over time, and because the data set is still relatively short, still varies considerably from month to month. In the early years, the trend appeared to indicate an enormous rate of sea level rise. Later, due to the 1997/1998 El Niño when sea level fell 16 cm below average, the trend actually went negative, and remained so for the next year. 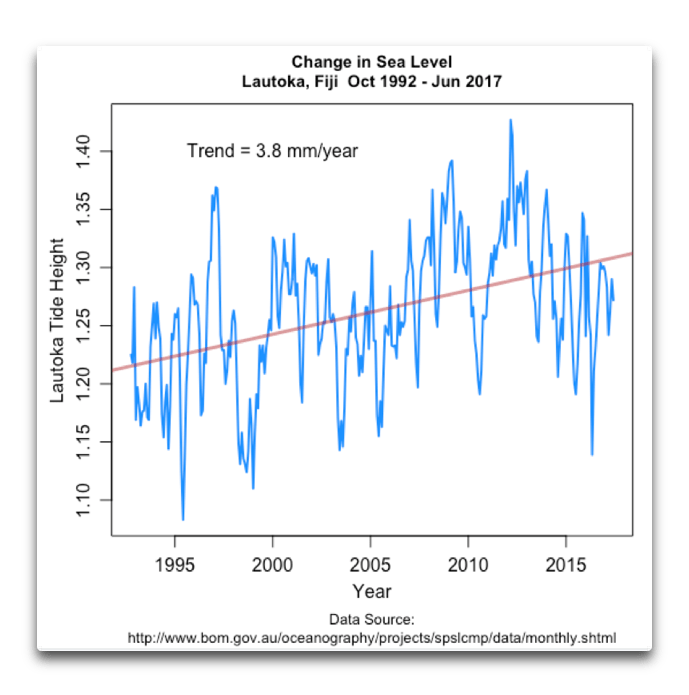 Over most of the past four years, the sea level trend has remained fairly constant. Do you have a link to more modern data for Lautoka? NTF couldn’t lie straight in bed; necessary to maintain the AGW component of their funding! Willis check the SEAFRAME data again. There is no trend for Fiji (based on Lautoka) since data commenced. Lautoka is the only accurate data available for Fiji. Suva shows a slight trend but it’s not a Baseline station. Can you show me how you see any trend in the Lautoka data? Sure. Thanks for providing the data. Here’s the graph. As you can see, tidal rise in Fiji is on the order of the rise in other parts of the western Pacific … and it is far from “no trend”. I don’t find Willis arguments useful at all here, the average global trend of SLR is not relevant when disussing the concept of rotational eustacy and its effect on Fiji for the last 500 years. jarlgeir, I’d be glad to answer if you quoted my “arguments”, because your vague accusations are worthless. Do you mean, for example, my argument, complete with graph, that the Lautoka SEAFRAME gauge shows the same order of sea level rise as do the other SEAFRAME gauges around the western Pacific? How on earth is that “not useful at all”? It directly contradicts Morner’s claims. Or do you mean my argument that Morner is not correct in his claim that corals grow up to within 20 cm of the surface and then grow horizontally? Do you have experience in this regard like I have, of dozens and dozens of dives on Fiji’s coral reefs? Waving your hands and dismissing things goes nowhere on this website. You want to argue with my ideas, you need to address them directly. My wife and I recently went back to Fiji. We were there in 1985 (32 years ago). We went to the same hotel and swam on the same reef. There is nothing different. It’s all the same. The Fijian politicians know that by claiming developed countries are causing climate change that they can claim $B is compensation. They won’t listen to the most eminent Nils-Axel Mörner because it does not suit their agenda, which is to claim compensation. This is the UN socialist plan. It’s all a great big con. No one mentioning Fijis Vulcanos. Situated at the ring of fire affects the ground level. As can be seen in the diagram above. Gage giving 6 mm/year and surrounding gages 1-3 mm/year has to be explained. I thought it was the cyclones they where affected by. Down 25 % last 40 years. On coral bleaching: During a period of persistent low atmospheric pressure the local sea level will rise and coral builds furiously. Then comes a period of high atmospheric pressure and the local sea level falls, so the newly built coral bleaches. Bleached coral then provides the evidence that the Great Barrier Reef is being destroyed by coal miners at 500 km distance. Leave it to those versant in geology to crash the spongy ramparts of AGW alarmism. The insults shal fly, and Climate Tinkerbelle will foist upon us a goodly dollop of pixie dust.